WE ARE A NUT FREE CLASS. PLEASE DO NOT SEND ANY NUT PRODUCTS INTO SCHOOL FOR SNACK OR LUNCH! THANK YOU!! 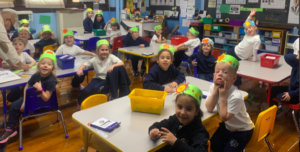 If you need to contact me you can reach me through our ClassDojo page, Option C, or by emailing me at rosalina.alves@notredamecatholicacademy.net. HOMEWORK FOR KINDERGARTEN WILL BE POSTED ON HERE DAILY. -There is one superkids’ club worksheet in the folder. Only glue the pictures that start with the letter Jj. SPELLING: words were posted on ClassDojo. Our test will be the Friday after we come back (May 3rd). This gives you a lot of time to practice the words. Spring Break begins tomorrow at 1:00pm when we dismiss. Our student of the month awards will be at 12:00, followed by Stations of the Cross (school auditorium). There is no after school, so please be on time at 1:00 pm to pick your child up. Spring break homework was sent home on Monday 4/15/19; these packets only come back on May 1st (the Wednesday we come back). Please post activities on your ClassDojo Portfolio for the Bingo sheet. We return on Monday April 29th. 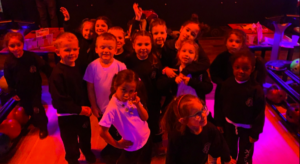 Monday April 29th – No club. Monday May 6th – No club. Monday May 13th – Mural Club meets. Monday May 20th- Final Mural Club meeting. 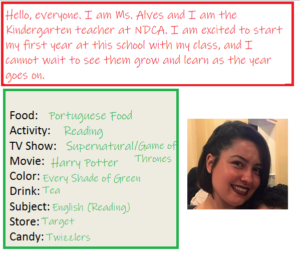 My name is Ms. Alves and I will be the new Kindergarten teacher at Notre Dame Catholic Academy. I am so excited to meet all of my new friends and help them learn how to read, write, and explore our world. I apologize for the lateness of this list. These items can come in by the first full week of school. 8- $20, so that I may buy the notebooks, scissors, and glue sticks in bulk. This makes it easier for everyone to have the same exact supplies. I know that buying school supplies can become expensive so I try not to ask for too much. If you feel comfortable supplying more than one or two of each item, it is greatly appreciated. I cannot wait to meet everyone, and to have a magical school year!